Who doesn’t like a healthier Lapis Sagu? 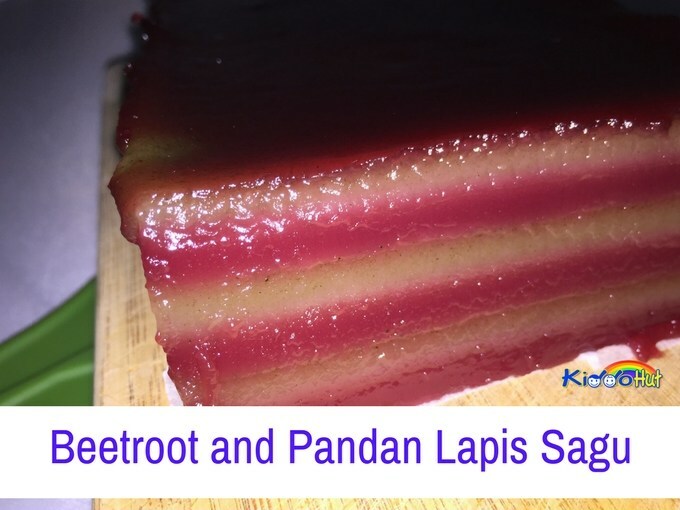 My toddlers love my Lapis Sagu but I have a concern over the artificial colourings and hence, came up with the natural colourings to make a healthier Beetroot and Pandan Lapis Sagu for my kids. Inspired by the original Lapis Sagu’s red and green, I used Beetroot juice for the red colour and pandan juice for the green although the green is pretty light from the photograph. In fact, I have made a Rainbow Lapis Sagu last month and posted the recipe. Click here for the recipe. Using almost the same directions, except for this time, I need to make the two batters separately as the colourings were added in the earlier steps. I have replaced the water content using the juices. As it is for my tots, instead of steaming 15 layers, I steamed only 7 layers and thicker layers for this time. You can always use the same amount of batter to steam a 15 layers cake. 4. This recipe is a scaled down as my tin is just 3″ by 8.5″. 5. 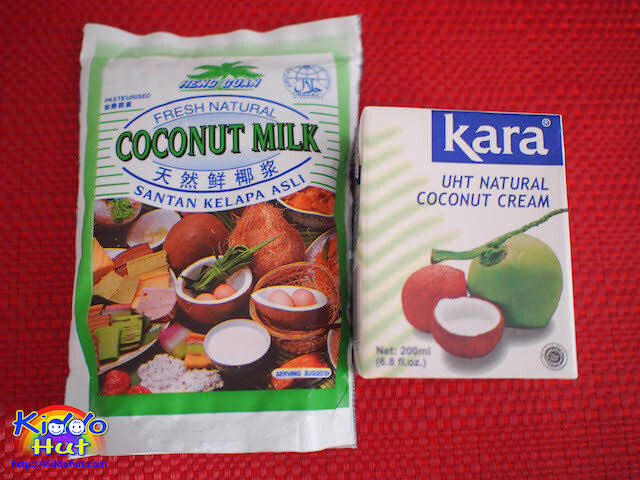 I have used the 200ml in a box for the coconut cream and 250ml in a package for the coconut milk. It gives a very aromatic coconut smell in the kueh. 10. Grease the knife before cutting. 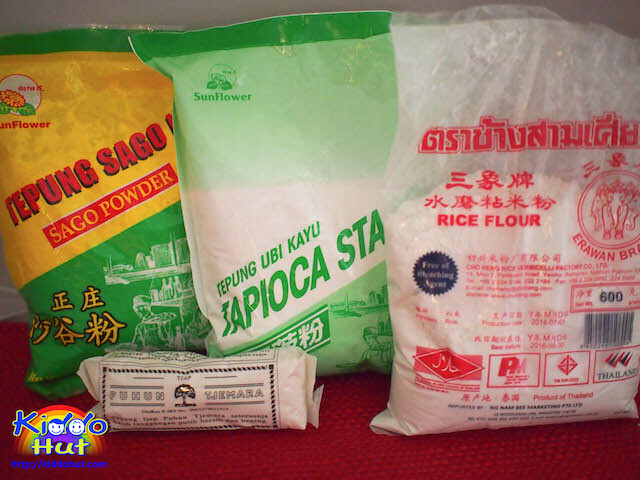 You will also need a greased knife to loosen the sides of the kueh from the tin to ease the removal from the tin. Obviously, I need to brush up on my cutting skill. Last but not least, if you wish to make a thinner layer, each colour should have 2-3 layers. 2. 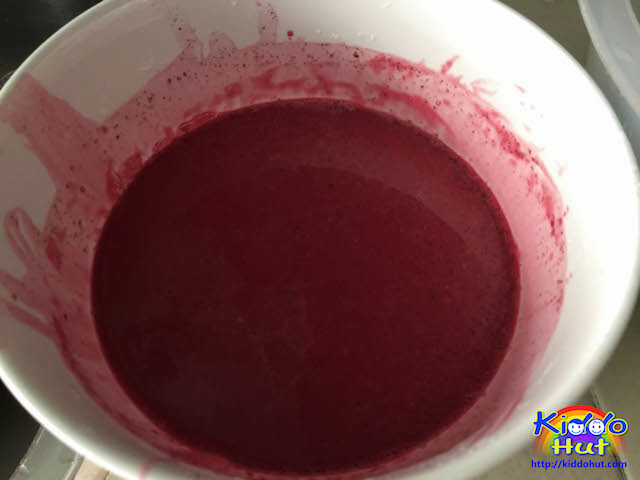 Blend the cubed Beetroot with 250ml of cool boiled water in food processor. Although you just need 230ml of juice, I prefer to err on the safe side. Do the same for pandan leaves. 3. Pour the juice together with the pulps into a cheese cloth and squeeze the juice. Set aside. 1. Heat up the juices separately to melt the sugar. After sugar melts, measure out 225ml. If inadequate, top up with cool boiled water and leave it to cool. 4. Do the same for steps 2 and 3, for the other juice. 5. Grease the aluminium tin with a little oil. Pour in one part of one of the coloured mixtures and steam for about 8 minutes. Repeat another layer with the same coloured mixture (if you are steaming thin layer) or with another coloured mixture (if you are steaming thicker layer like me) and steam for about 6-7 minutes. 6. Repeat step (5) with other coloured batter until all batter is used up. Leave the cake to cool at room temperature for 3-4 hours before cutting with a greased knife. Serve. 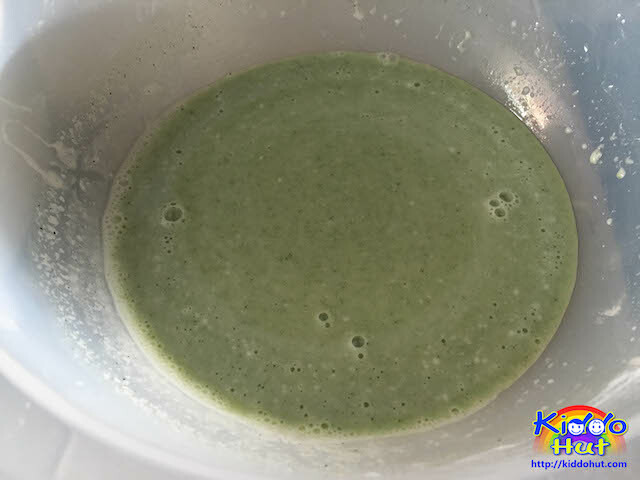 If you have enjoyed reading this recipe, do like my Facebook page to get more upcoming fun and informative recipes. You can also follow me on Twitter, Pinterest and Google+ for more updates on recipes. Thank you for visiting Kiddo Hut!